Spring is finally here! That only means one thing, well other than Easter chocolates, new baby lambs and pretty daffodils, it means we can spring clean our wardrobes! 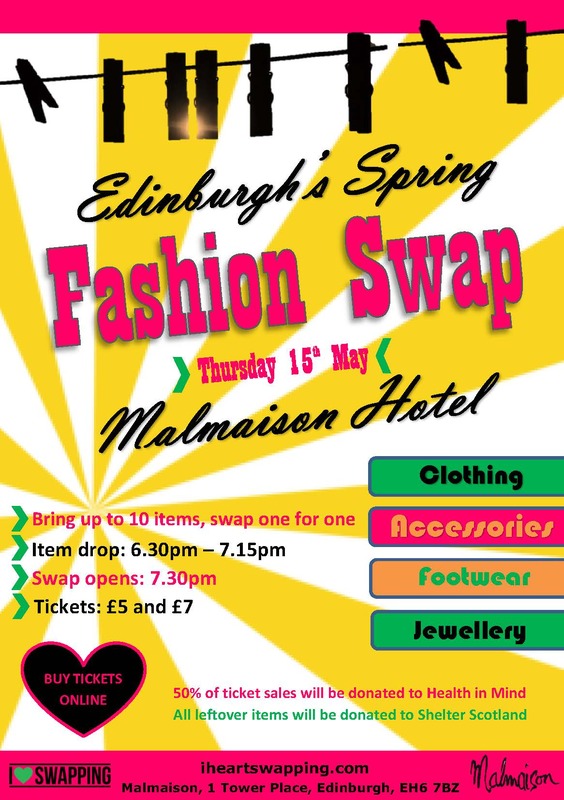 #edinburghfashionswap is the perfect event to help you through the process of clearing out unwanted fashion items and getting new treads in return. Let’s all cross our fingers the sun stays out too. We are super excited to be holding our event at the boutique Malmaison hotel based in Leith. Once you have dropped your items off and before the event opens enjoy some time in the Malbar while we set everyone up behind the scenes. The Malbar will be stocked with classic and quirky cocktails and bubbles to tempt you so go on, treat yourself. After all with Spring in the air the nights are finally getting longer and who doesn’t love a cheeky Thursday night drink with friends? So grab your unwanted items, your best friends and head down for some late night shopping with a twist. Once again all leftover items will be donated to Shelter Scotland and 50% of ticket sales will be donated to Health in Mind who are working hard to promote positive mental health and wellbeing in Scotland. The concept of our events are simple; all you have to do is bring along up to 10 fashion items that you don’t love anymore for one reason or another, whether it doesn’t fit, you don’t like it, it’s been in too many photos or an unwanted gift. As long as it is in good enough condition that someone else would want then bring it along, it doesn’t matter what size, shape or style; fashion is for everyone. At the event you will receive a peg as currency for each acceptable item you bring along, one item = one peg. Once the event opens everyone has an hour to pick the items they wish to take home (although you probably won’t need more than 20mins). You hand your pegs back, one peg = one item and then you are free to enjoy your ’new’ wardrobe. Simple! See you soon fashionistas and bargain hunters for some serious swapping action!